Is it just me, or does Yukizane bear something of a resemblance to Iroh from Avatar The Last Airbender? Was that on purpose Suburban Samurai, or just a coincidence? 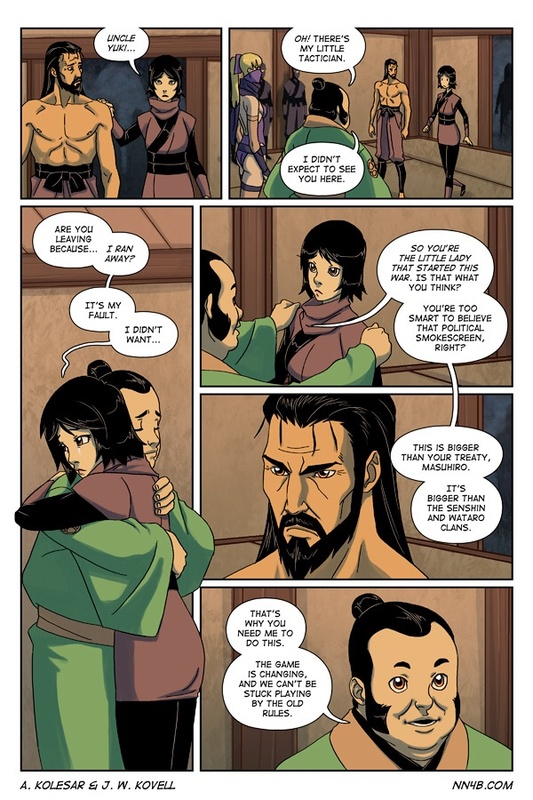 You’ll have to ask the creators of Avatar ’cause Yukizane came first! You have no idea how much this made me laugh. Either way, they are both awesome characters! Yukizane: the Father Ina wish she had. Oh, no! Yukizane’s turning into Cryptic Old Guy! He has a PHD in Cryptology. Seems more like a PHD in Mysteriousness with extensive research in Political Subterfuge and Combat Stratagems. I think neither is grammatically incorrect, but I do like your wording better. I’ll add it to the list of tweaks to give this page. Masuhiro’s scowl may frighten his enemies but Yukizane’s eyes looks right through your soul. Joe had expressed concerns that no one would catch the Lincoln reference! His worries were unfounded, it would seem! I believe Ina is missing her scarf thing in the second panel. Ha! It must’ve fallen off, and then, you know, she put it back on. How many of you talk about politics when hugging your relatives? … I should certainly try that too! There are plenty of relatives that would stop hugging you so much if you did that. So what you’re saying is I should try it… Right? If you don’t want those relatives hugging you, then, yes. Beware. You may accidentally mention politics to a political junkie, and then they may talk to you more. about politics. Awwwwww… Little Tactician and Big Tactician huggles. And- is that a tear down Ina’s cheek? I need an Uncle Yukizane. EDITION CHANGE! NN4B switches over to 3rd edition rulebook! Just as long as they steer clear of 4th edition! Nah, they jump over it into 5th edition of Shadowrun: Tao style. Surprise twist; Matrix and Lex are actually Deckers hired by the Renraku and Shiawase corporations respectively to gain control over a lost corner of the net represented as a recreation of feudal Japan. And everyone here is just VRing and have already forgotten the real world? Pretty much. Either that or they do know and the entire story is actually just one big allegory of the mind. 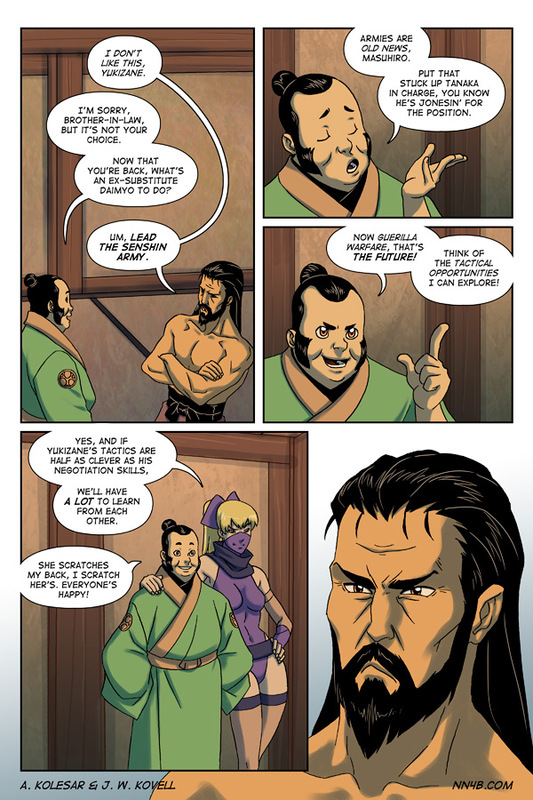 Obviously its going to become a ninja webcomic because Ninja have no need for Bushido! Yuki: Look, I’ve got a job to do. Where I’m going, you two can’t follow. What I’ve got to do, you can’t be any part of. I’m no good at being noble, but it doesn’t take much to see that the problems of three little warlords don’t amount to a hill of beans in this crazy world. Someday you’ll both understand that. The game is changing. Winter is coming. See, Yukizane just recruited you a whole ninja clan [i]without having to pay them[/i]! Use the angled brackets, like in basic HTML. I know this is an old post to make this comment on but I am doing a reread of NN4B. And since I know Subuurban Samurai is a fan of Brandon Sanderson you may find it interesting to know that Yukizane’s speech here about not getting stuck in old ways, which I acknowledge came first, reminds me of Dalinar’s speech about his not following things JUST because they are old, as well as the origin of why his master tied his takama three times in Oathbringer. Basically this is a case of great minds thinking alike.